What Can I Eat if I Have Colorectal Cancer? Colorectal cancer and its treatments can often impact the way the body digests foods, fluids and absorbs nutrients. For patients and survivors, incorporating healthy, plant-based foods and lean protein into your diet can help your body stay strong and nourished during and after treatment. Patients with colorectal cancer should try to eat small, frequent meals to help ease digestion and manage side effects of treatment. 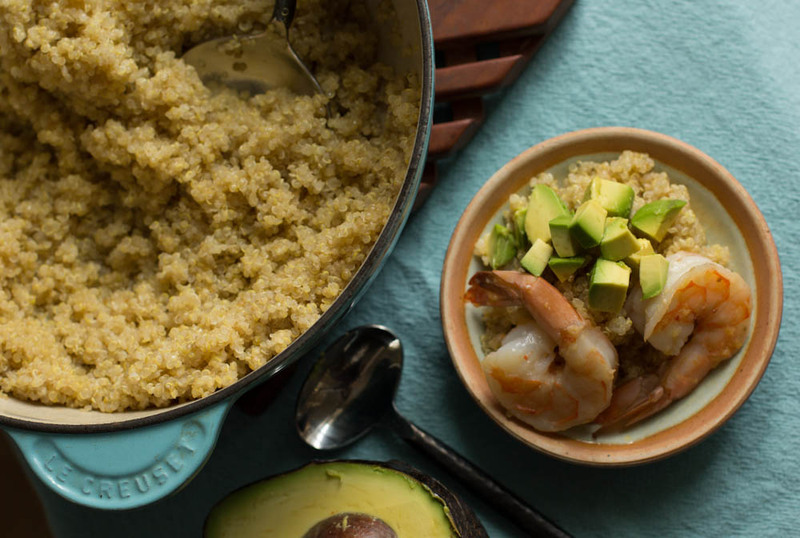 Try these Shrimp, Avocado and Ginger Bowls, which incorporate quinoa, a whole grain packed with nutrients. Fill your plate with lots of fruits and vegetables. There is no one winner; each color family is ideal because they are packed with immune system-supporting nutrients. Dark green leafy veggies, mangos, berries, and melon (like cantaloupe), are healthy choices and can be a great snack. Drink water and stay hydrated. This can aid in digestion and ease side effects like constipation and fatigue. Try infusing your water with berries or lemons if plain water is not appealing. Limit caffeine and alcohol. This can also help to improve energy and many medications do not mix well with usual amounts of caffeine and alcohol. Try minimally processed dairy foods that are rich in calcium and vitamin D, such as plain Greek yogurt. The probiotics in these foods can be helpful for digestion. Look for whole grains like steel-cut oats, quinoa, and brown rice, which provide fiber and important vitamins and minerals like iron, magnesium and folate. Stay away from excess sugar. An ideal colorectal cancer diet is similar to that of a diet for diabetes patients; eat often, include a protein source and limit processed, refined carbohydrates, sugary drinks and desserts. Eat small, frequent meals. This can make it easier to get all the nutrition you need when dealing with appetite or weight changes, and may also help the body ease digestion and absorption. Small, frequent meals are a great strategy for symptom management beyond appetite changes, like fatigue, reflux and diarrhea. When it comes to prevention, studies have shown that a plant-based diet that incorporates fish rich in omega-3 fatty acids may help to reduce inflammation and lower the risk of some types of cancer, says Dana-Farber nutrition expert Stacy Kennedy, MPH, RD, CSO. Many fatty fish are also a rich source of vitamin D, which has been shown to help protect against colon cancer and other malignancies, Kennedy says.